It was hard to choose which college slasher to go with because I love a lot of of them. College slashers are my favorite type of slasher films. You have The House on Sorority Row, Killer Party, Black Christmas, The Initiation, Urban Legend, Scream 2, Girls Nite Out, Final Exam, Night School, and Sorority Row. 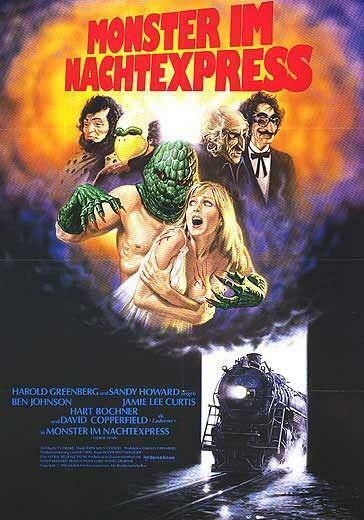 But I decided to go with Terror Train because it’s one that stands out from most of them because instead of taking place on a college campus or in a Sorority house it takes place on a train! The basic plot opens the film up with a college party happening where I horrible prank goes wrong with one of the college students. Years later to celebrate their last New’s Party before going out into the real world, Alana (Jamie Lee Curtis) and her friends decide to celebrate on a train,but what they don’t know is someone (not invited) comes aboard and starts slashering away one by one through the college students before getting to Alana. Could this person be someone they know who wants to get revenge or could it be just a random psycho in many disguises? Step aboard Terror Train! This is a personal favorite slasher film of mine, and one of the best college slasher films. There are many things I love about this film. One, Jamie Lee Curtis who started her career in the horror genre and this genre is some of her best work in my opinion. I don’t think anyone will forget her in John Carpenter’s Halloween either. Second, I love the creepy atmosphere and the killer. What I think makes this killer so creepy is that he or she always dresses in many costumes through out the film and some of those costumes are pretty creepy. I love that the killer uses their eyes to show some type of personalty which is very creepy. Also, I love that you try to guess who the killer might be and when you find out who the killer is at the end it is pretty shocking the first time you see the movie. Third, I love that they put these college students on a train and when in danger it’s hard to runaway from the killer. The kills aren’t too special in this film,but their many other things that make up for this film that I mentioned. If you haven’t seen this 80’s gem then I highly recommend it especially since it is getting a new DVD/Blu-ray release coming soon from Shout Factory. Perfect film to watch around the Halloween season. So get some popcorn with a good drink, and watch this fun slasher film.